It is interesting that a lot of people in my life, including myself, have moved to a new house or apartment this month, happily to better situations and places of growth. Moving can be a stressful situation, but also a wonderful one- You get to start fresh in a new place! Even if you move into a hundred year old building there is still a sense of being refreshed. Moving also gives you the chance to get rid of excess baggage, and buy or make new things that are appropriate for your new place. I find I learn a little bit more about myself every time I relocate, realizing things I keep and discard. Besides family photos and a few art projects I have discovered that I have quite the opposite of an attachment problem. With this recent move especially I donated and threw out almost everything since my significant other and I moved into our own place with no roommates. We got a little over excited to buy and make things together that we didn’t really think of necessary things that we should keep/have. For example, oven mitts! Those handy (no pun intended) little things the you probably never think about on a regular basis until that first night in the new place - dishes and the like still packed away, you decide to make a pizza and when the timer goes off on the oven you realize- you don’t have any. At Bolt we have several, great, books on sewing things for around the house, and I took this opportunity to browse through them. Even if you aren’t planning on moving any time soon, I would still suggest perusing through these books. They have wonderful, easy, and quick projects that you can do to spice up your nest or make for gifts. The two books that I referenced were Home Sewn Home by Sally Walton and Simple Sewing by Lotta Jansdotter. There are projects for every room in the house (including oven mitts!) items that you realize you could redo, or wonder how you lived without. Also included are some fun projects to create that can make your home sweet and darling. I’m a morning person and my guy is a night owl- and we live in a studio. To make it a win win situation I made us some sleeping eye masks from a new line of organic cotton at Bolt, utilizing our selection of trim and fun elastic. 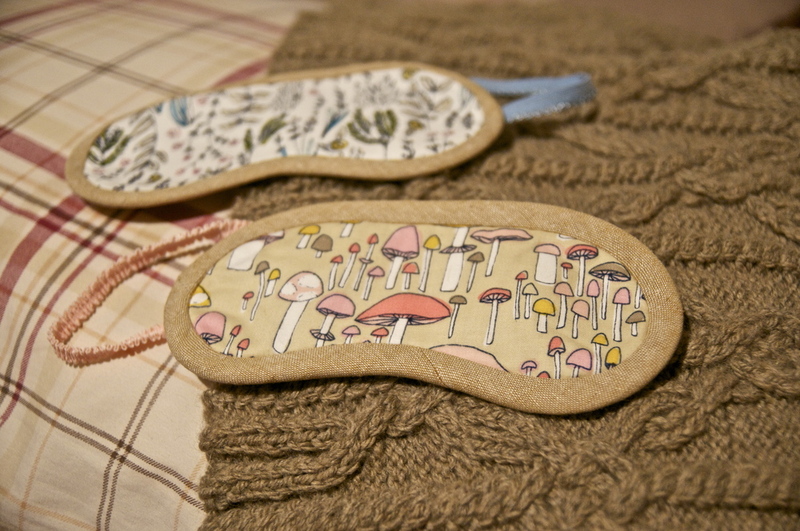 You can use your scraps of cotton batting from making oven mitts, or quilting projects, to line the eye masks to make them super soft against your face. Another project that I did just for giggles is a bath cap. Who doesn’t like to relax every now and then in a nice bubble bath? With my hair getting ever longer by the day, I have had the problem of accidentally soaking my hair in bubbles when I didn’t intend to, so I figured I would probably use this project at some point. This is an especially fun project to complete and I would highly suggest experimenting with trims, bias tape, and ribbons. For a bath cap you only need half a yard of fabric, or one fat quarter for the inside and outside. Using two different fat quarters can be fun because the cap can be reversible. I used a fat quarter of some chocolate treats print that we probably still have floating around the store bins for one side (because every bubble bath requires chocolate) and a solid color for the other, to add subtle detail.